As recently as a decade ago, making the quietest dishwasher was not at the top of manufacturers’ mind. Most people capitulated after all dishwashers were merely known as loud appliances, nearly all of them rising above 60 dB or louder. (This is the approximate volume of a propeller plane flying overhead.) The sound of a dishwasher could be heard throughout the house, and it seemed that this was simply the way things would always be. In the early 2000s, Bosch changed everything with an advertising campaign that touted the brand as the quietest dishwasher in the world. Suddenly, brands throughout the market were scrambling to find ways to make their dishwashers quieter, and customers took notice. Today, most people list noise concerns as their number-one decision point when it comes to choosing a dishwasher. Unfortunately, manufacturers assume that we all have an engineering degree and push various decibel (dB) ratings and associated price points to us. So, if you are unclear about decibel (dB) ratings and how various brands and models compare when it comes to noise you will find our guide useful. We even made an informative video with an actual sound test for decibel comparison. You will find great visuals and a decibel chart in our production. This way you will be able to select the best and the quietest dishwasher to meet your needs and your budget. What does the decibel rating on a dishwasher mean? Manufacturers love to use decibels to describe the noise levels of their machines. But the funny thing is, most of us have no idea how loud decibel levels are or how they compare. Manufacturers simply assume that if they advertise a decibel level with enough vibrancy and excitement, consumers will assume it’s an impressive figure. Then they have the dishwasher installed only to find out they can hear it from their bedroom. So let’s talk a bit about decibels when it comes to dishwasher ratings. Decibels are a unit of measurement that is what mathematicians call logarithmic, meaning it goes up in powers of ten. Which means that a decibel number that’s 10% higher than another isn’t going to be 10% louder. For example, a 70db sound is actually twice as loud as a 60db sound.. A 50db sound is one-fourth as loud as a 60db sound. We figure, you get the picture on decibel comparison now. When it comes to dishwashers, it’s important to note that all modern models are now quieter than 60db. At the very least, we recommend finding one that’s 50db or quieter. (Remember, this is a quarter the volume of 60db.) 50db is roughly the noise level of a quiet conversation, and we have found that it’s usually more than quiet enough for most people. However, an open floor plan kitchen might have you looking for something even quieter, and those options are available. Having said that, the truth of the matter is that paying extra for anything below 44db is a waste of money unless you plan on sleeping in your kitchen every night. We’re talking about the volume of a library, so if a brand claims that anything lower than 44db is the only acceptable volume—ignore them. At 44db you may still hear a very slight noise coming from the dishwasher so if you are extra sensitive to sound there are models available as quiet as 38db. But for most homes this will be overkill. What Makes a Dishwasher Quiet or Loud? The factors that go into determining how loud a dishwasher will be while running are numerous and diverse. The main sources of noise within a dishwasher are the movement of water through the water pump, the drain pump removing water from the space, water moving and bouncing off of surfaces within the dishwasher including the wash tubs and plates, and the movement of dishes within the device. Units that utilize a hard food disposal system tend to be louder, as well. That being said, manufacturers have found effective ways to minimize the amount of sound that is produced and how much of that sound escapes the dishwasher. Some of these design innovations involve the washing process itself, using quieter pump systems and variable speeds that keep the dishwasher from constantly running at full power (and full volume). Another tactic manufacturers use is to add insulation around the unit to keep noise from escaping. This helps keep any sounds isolated to the inside of the dishwasher. Comparing brands when it comes to their decibel claims can be tough, because there is no standardized practice for measuring noise levels. This means that one company could be measuring at a distance of one meter while another is conducting tests from across a warehouse, or in a different type of room. Besides, are the brands considering the noise levels during water intake or discharge or are they measuring quietness during wash cycles? What is the soil level of the dishes during the test as the advanced sensors will adjust water pressure and cleaning intensity based on samples taken throuhout the cycle. You can see from these examples how decibel level readings could be misleading. Your only truly safe bet is when making relative comparisons between models offered by the same brand, because they at least can be expected to use the same noise testing methods. Bosch and Miele are two brands who have been battle-tested and shown to have the best noise ratings across the board, so these two are always a safe bet. If you’re ever in doubt, ask around to see if any friends or family members can vouch for a certain model’s volume level. This is much better than taking brand’s claims at face value. When it comes to quietness Bosch puts in the most amount effort. In fact, Bosch dishwashers are so quiet that they project a beam of light (in Bosch language infolight or timelight) to the floor to indicate they are working. Bosch makes over 100 dishwashers and it can be overwhelming to choose one that matches your needs. We prepared an in-depth Bosch dishwasher review article that covers all series and models. Miele makes the best dishwashers in the world when it comes to cleaning. Similar to Bosch, Miele dishwashers are extremely quiet. 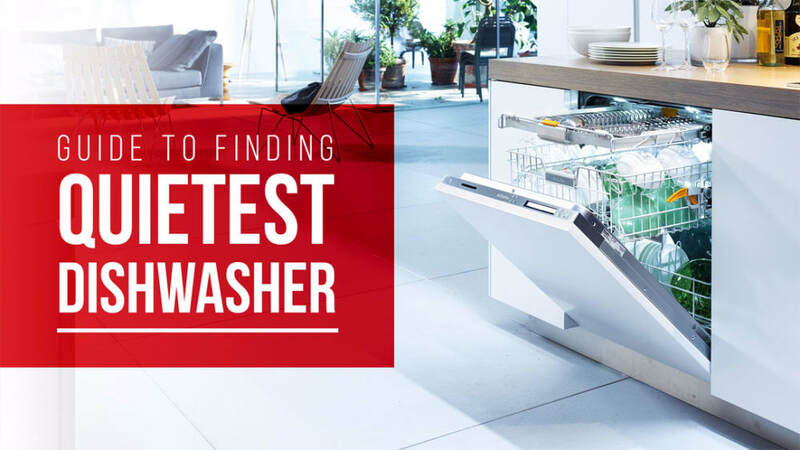 We prepared an in-depth Miele dishwasher guide to help you select the best product which has the features that are tailored for you. GE makes quality appliances. Although most of the GE dishwasher catalog is not a poster-child for quietness, the GE Profile series dishwashers are very quiet at 40 dB. Over the past 3 years we have noticed that even the low-cost dishwashers are becoming quiet. This Whirlpool has an acceptable price/performance ratio. Dishwasher drawers are getting more popular in the US. Fisher Paykel is the only brand that makes drawer dishwashers. Although, the drawer design has some inherit drawbacks when it comes to distributing water quietly in the tub Fisher Paykel has done a great job keeping the noise at a minimum. Fisher Paykel DD24DAX9N Double DishDrawer is the most popular drawer dishwasher and features a 45 dB silence rating. More and more manufacturers are developing quiet dishwasher models, however Bosch and Miele are two brands who have been battle-tested and shown to have the best noise ratings across the board, so these two are always a safe bet. If you’re ever in doubt, ask around to see if any friends or family members can vouch for a certain model’s volume level. This is much better than taking brand’s claims at face value. In addition, when choosing a new dishwasher you may need to consider additional factors besides quietness alone (such as ability to clean and dry). Check out this comprehensive dishwasher buying guide for useful tips and hot models.